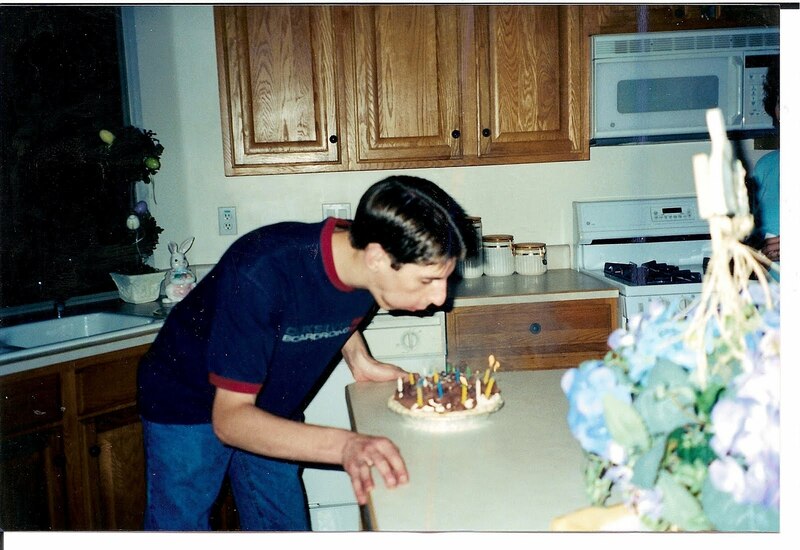 Vintage Dill blowing out his candles 10 years ago. Ah, ringer tees. Today is Dilly-pie's golden birthday. That means he's 28 on the 28th. It only happens once in a lifetime -- your birthdate matching your age. Mine happened when I was 7. I didn't know about golden birthdays back then, and I felt totally robbed when I found out about them years later. I mean, it's not like I can go back and have a belated golden birthday. That's like taking your wedding pictures after you've had three kids, gained 20 pounds and chopped 10 inches off your hair. For Dill's golden birthday, we went on a super-hot date to the Phoenix Suns game last Wednesday. As an added bonus, they won! It was pretty exciting. The Suns are Dill's favorite team, and basketball is his favorite sport. On Saturday, we had an outdoor family party for the Golden Boy and the Smush. (Yes, I combined their parties. I'm officially a bad mother and wife, I already know.) The weather was perfect! The Smush got some delectable homemade lemon cupcakes topped with fluffy lemon buttercream and for Dill -- a homemade French silk pie (his other favorite). Gifts included money, gift cards, Big Cup Reese's and two packages of Cadbury Mini-Eggs (another favorite -- this guy has lots of favorites, obviously) for the big boy and some cash-ola, cute toys, clothes and books for the littler boy. Everyone was pretty stoked about their loot. Sadly, this post will include no pictures of these events since 1) Suns game pictures are on Dill's phone, which went with him to work and 2) when we went to take pictures at the party, we realized we had forgotten to put our memory card in the camera. So we only got about four pictures of Smush eating his smash cake, and they're on the camera's internal memory. And the cord which allows me to transfer said pictures to the computer is currently in Dill's car at the car hospital. Again, Bad Mom Award right here. I'll be sure to post the too-cute cake pictures as soon as the blessed Elantra is discharged. And since I love when things come full circle -- happy birthday, Dill! Going to Joe's Real BBQ (another Dill favorite. Surprised? Well, favorites are what birthday are about, after all) for a free birthday dinner. When was YOUR golden birthday, or are you still awaiting the occasion? Mine isn't for another 3 1/2 years! The 29th. But it's ok. :) Happy birthday to Dill! :) And your little baby boy! Glad they both had a great birthday! Thee more years for me :) Oh boy, wonder where I'll be at 27! happy belated birthday to him! mine was at 22. seems like it was only a year ago... but it was over 4 years ago. man, i'm getting old. Mine was my 6th birthday, and I knew nothing about Golden Birthdays. (And still didn't, until this post from you.) I do remember my sixth birthday, though. I had a Cinderella cake. mine was 24, but I didn't celebrate it properly. Maybe this year can be extra special: the 10 year anniversary of my Golden Bday. Wow, now I think I'll have 2x the cake!